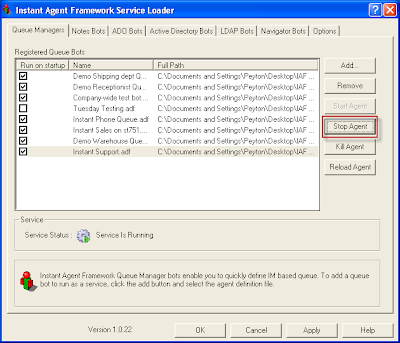 At times IQM administrators might not be able to gracefully shutdown a Queue Manager Instance running under Service Manager using the "Stop Agent" command button. In this scenario it is recommended that you use the “Kill Agent” command to terminate bot instance. This will immediately stop Queue Manager Instance.